This post is sponsored by Coats Direct and Shopbop and may also contain affiliate links. It’s finally feeling like fall! I’m just about ready to pack away all the skimpier articles of clothing in my closet and replace them with knits, pants, and, you said it: coats! It’s not cold enough to bust out the leopard-print or wool coats yet, so the one thing you’ll be catching me in all this month is going to be the versatile black trenchcoat. It’s lightweight, chic enough to throw on over anything, and of course, black matches with mostly everything in a darker fall wardrobe. My black trench is by Laundry by Shelli Segal from Coats Direct (sold out but they carry a similar one here). There are some styles of coats and jackets that are classic, timeless and thus worth investing in, and Coats Direct has a lot of great designer coats that will last you a long time. The sales from Coats Direct are amazing too: we’re talking wool coats from $400 to $160 and leather moto jackets from $452 to $180! Side note, while we’re on the subject of sales, I know I mentioned Shopbop’s semiannual sale last month in September but I noticed they still have some super crazy good sales. I skimmed through their sale section and found some amazing deals on coats and jackets, shoes, jewelry and more! Make sure to “Sort By Price: Low to High” if you want the best deals. The 70% Off & Over section also has so many good sales like this super beautiful Thurley royal blue crochet dress that’s normally $595 and on sale for $178.50. Steal. 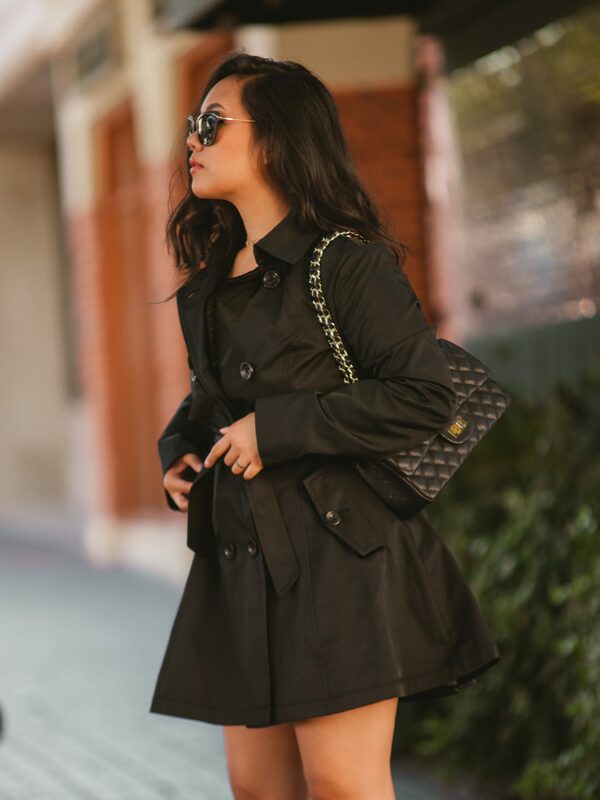 Back to the iconic trench coat: although it looks killer in every shade known to man, I always recommend having a black one in your closet. Not only does it match with everything but it’s also an appropriate coat to throw over your work clothes, cocktail dress, or need I say, funeral attire (let’s just hope that doesn’t happen!). It’s professional, modest, and you can dress it up or down, casual, or upscale. And hey, if you’re ever in a true pinch, you can always button it up and wear it as a dress with some over-the-knee boots or heels! What’s your fall wardrobe staple? Let’s chat in the comments and don’t forget to subscribe to my newsletter below for more fashion and styling tips. Clothing should change often with new ones to change the attitude of the man, the new spring season predisposes to buy new clothes and shoes.